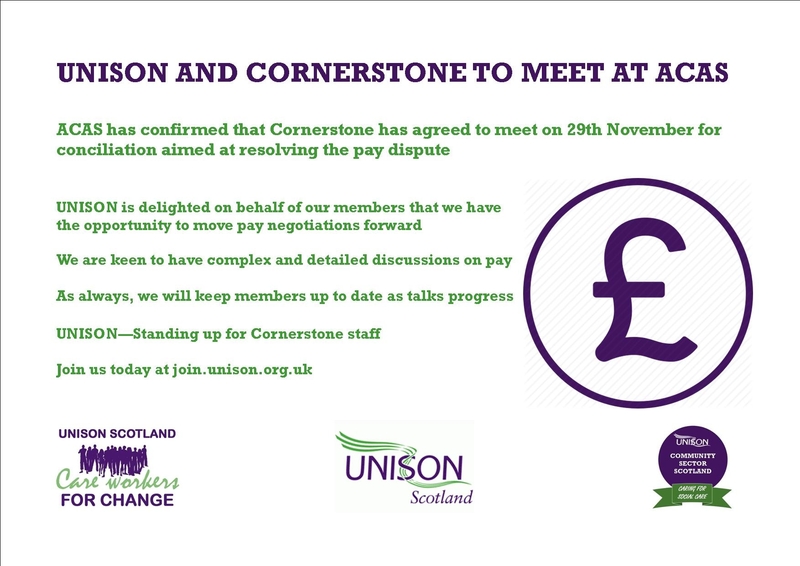 UNISON is delighted to announce that ACAS has confirmed that Cornerstone has agreed to meet with us on pay. This will be formal ACAS conciliation aimed at ending the ongoing pay dispute, and will take place on 29 November 2018. Your UNISON stewards are delighted that we will have the opportunity to move pay talks forward and welcome the opportunity to have complex and detailed discussions with Cornerstone. You can see our letter to Cornerstone asking them to join us at ACAS by following the link below, which was previously circulated. We will keep you all up to date with things as they progress, so please check the usual places for updates. UNISON – Standing up for Cornerstone Staff! Next Post:UNISON statement on Cornerstone decision to de-recognise.